The following are general maintenance and care tips. Proper care may vary depending on the condition and type of stone that you have. If you have any questions call a stone care professional. The three most important task that can be done on daily basis to keep the stone looking new and extending the time before restoration is required are: Dust Mop, Dust Mop and Dust Mop. The most destructive material to most stone is sand, dirt and miscellaneous grit. If these substances could be eliminated, maintenance of the stone would be almost non-existent. A stone floor can never be dust mopped too often. Use a clean, non-treated, dry mop at least twice a day in high traffic areas and less often in low traffic areas. Entry floors require walk off mates that will cover two adult steps. This will eliminate a good portion of sand, dirt and grit. Remember to shake or wash off the mat frequently to remove accumulated dirt. Be aware that rugs with rubber backs can leave marks in your stone requiring costly restoration to remove. Remember if sand, dirt and grit are eliminated there will be nothing left behind to scratch and dull the stone. Household chemicals are not formulated to clean your stone. Many can do more harm than using nothing at all. Neutral cleaners are recommended. Damp mop your floor weekly with a neutral cleaner. Follow the directions. Vanities, counters and walls can be cleaned with an appropriate cleaner put in a spray bottle. Spray the surface and clean with a soft natural fiber cloth. Repeated use of an appropriate cleaner will keep your stone looking fresh and add to the natural luster of the stone. 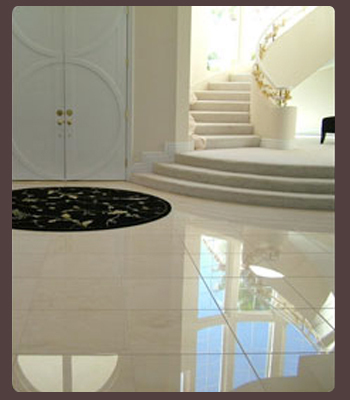 Correct cleaners are much cheaper than having to pay a stone professional to restore your marble. Pick up spills immediately by blotting with a white paper towel or clean fiber cloth. Dust mop floors often to extend life of shine. Call a professional restoration company if you experience problems . "At Perfect Marble we care about your marble looking perfect"